Wondering what your child is doing at Club Kids while you're getting in a great workout? Here is the July agenda filled with fun activities, crafts, exercises and education for your little one to enjoy and tell you all about! Howdy Partners! You outta stop on by Club Kids this week for some Wild West Fun. We will be brewing up crafts like a cactus, horse shoes, cowboy boots & more. And I reckon we’ll be doing lots of exercising, playing & reading. We sure would like to see all you youngin’s for a good ole time! There is so much to explore in outer space! So much that we don’t know! 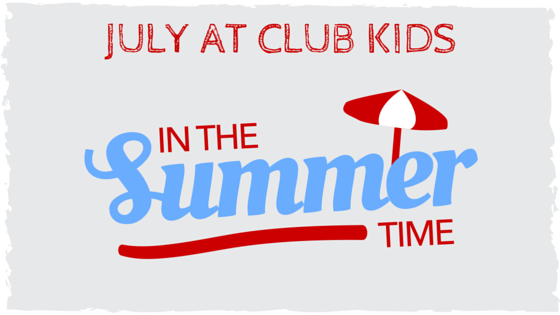 This week at Club Kids we will be having fun with our theme of Out of this World! Give yourself a much needed break & quiet/peaceful workout while the kids are making super cool crafts, reading books & doing puzzles about planets, and, as always, getting in their own pint-sized workout!